The beginning of the year is a time for reflection, so I have done that. Below are two narrative versions of my year. Both of these stories are true. The year 2018 was difficult. At the end of 2016, I broke my foot. Believe it or not, I am still dealing with the repercussions of that. I realized I have a lot of strength imbalances, so it has been a year of rebuilding that strength to correct some oddities of my foot strike and also trying to get my racing confidence back. Because I was unsure of my fitness, I tried a bunch of new racing distances with mixed success. In March, I ran a personal worst in a half marathon. It was awful. The week prior to the race, I ran the course as a training run, 10 seconds per mile faster than I ran the day of the race. (Wow, Sabrina. Pull yourself together.) I also had a lot of runs in which I felt like absolute garbage, intermixed among my good runs. This year, my husband and I moved to Kentucky. I don’t like change, so that was hard. I’ve had to create a new routine. It rains a lot, and I rarely see people my own age. In late October, I tripped on the trail and cut my knee open, and because of this, I needed to change my racing calendar. On the personal front, I should work on my strength of presence—being fully present where I am, rather than worrying about what comes next—and I need to become a more careful technical writer of philosophy. Every now and then, I am still annoyed that I never grew tall enough to play professional basketball, and I still have an abiding, oppressive guilt that I haven’t picked up my violin in years. My clothes rarely match. I look weird in hats. I am too quiet in group settings. Life is tough. 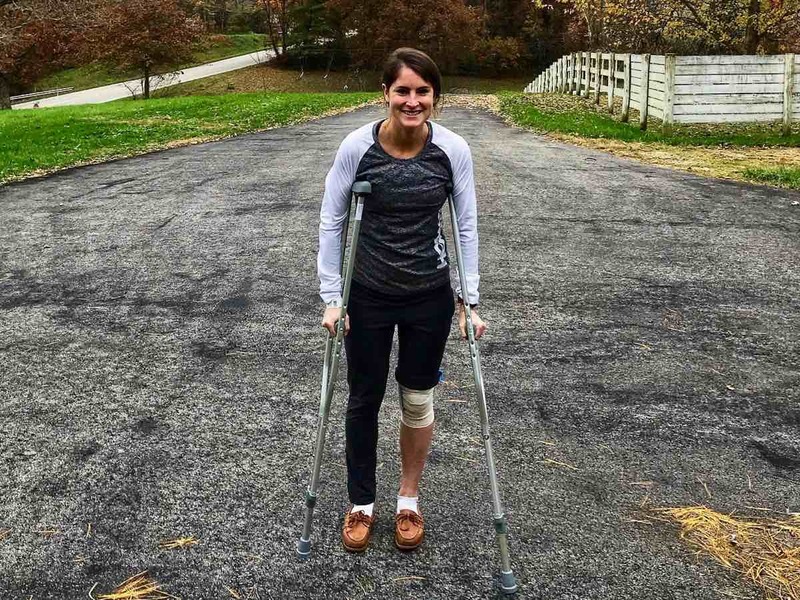 Sabrina Little after badly cutting her knee open while trail running in 2018. All photos courtesy of Sabrina Little. The year 2018 was wonderful. After a difficult 2017, when I was recovering from my injured-foot apocalypse, I finally got my feet back under me—literally and figuratively. My racing confidence was mostly restored. I was able to handle high volumes of training again, and I covered about 4,070 miles. That’s an average of 11.15 miles per day, for 365 days. 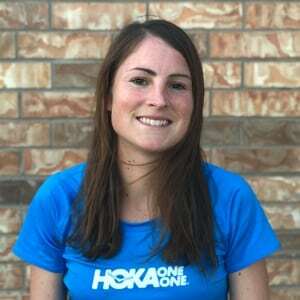 I won two national titles, and I loved competing in my first vertical stair mile–I landed on the podium. 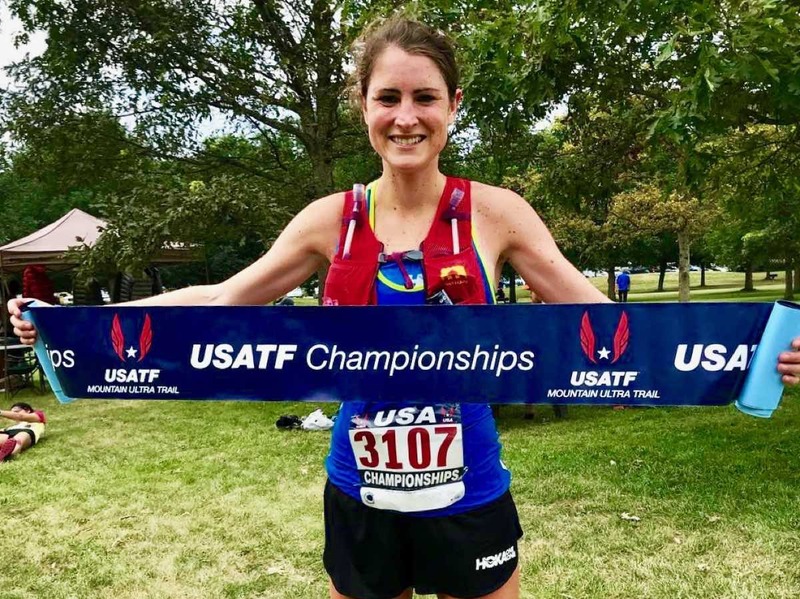 I represented the United States as part of an amazing American team that won the bronze medal, set three personal records this year, beat all the men in two 50ks, and broke three course records. I had a tough half marathon, but I learned a lot from it. (Rest before races, Sabrina, you crazy person.) Ultimately, I appreciate that I had that experience because hard things are the best teachers. Also, I had a stumble on the trails and cut my knee open in October. This was a blessing in surprise. It gave me the rest period I needed but never would have taken on my own, and I was able to enter a 50k feeling fresh and snappy. On the personal front, I’m still not a perfect agent (no one is! ), but I am getting better at being organized and managing my time well, which is good timing because I am working on my dissertation and need to self-govern effectively. I finished my doctoral course work, defended my prospectus, taught my first college course, read a lot of great books, participated in two incredible summer seminars, and presented at three conferences this year. My husband and I moved to Kentucky because he was blessed to start a job teaching at Morehead State University. It is beautiful here. Life is great. After winning the 2018 Cayuga Trails 50 Mile. The stories we tell say a lot about us. We probably all have that one friend who, when anything good happens to her, says something like, “Yes, that was great fortune, but I’m sure tragedy is just around the corner!” Or, conversely, she says, “Something bad happened, but I learned a lot and things are going well all things considered. How are you?” The facts are the same, but the framing of events is different. Another example is this: I used to ask whining track athletes to tell themselves a different story. Rather than telling themselves a victim tale of “coach just put me in the 4×400 after I ran the mile,” they could tell themselves a heroic tale of overcoming the odds. So, recently, I have been revisiting the stories I tell about myself—to examine whether I am telling sad tales about my life, or hopeful stories, and whether I am obscuring reality in some way. In After Virtue: A Study in Moral Theory, Alasdair MacIntyre says that we are story-telling animals: “[M]an is in his actions and practice, as well as in his fictions, essentially a story-telling animal. He is not essentially, but becomes through his history, a teller of stories that aspire to truth.” (1) This is true. Otherwise, the information I provided above is just a series of disconnected facts that have no bearing on my self-understanding, and I can’t see my life events in relation to my goals or purposes. In fact, the stories I tell have a lot to do with how I conceive of who I am, the significance of certain events in my personal history, and where I think I am going. A lot of people are talking about goals at the moment, to start the new year on the right foot. I want to contribute to this conversation by asking about the types of stories you are telling about yourself (consciously or unconsciously), and the stories you are a part of, based on three big questions. Is This Story True and Complete? In December, I was reflecting on my year, and I posted the second, triumphant version of my story from above (in abbreviated form) on Instagram. And actually, I saw a lot of stories like my own. It is as though we have all adopted the scripts of ancient victory stelae. We are like the Egyptian pharaohs who record our triumphs without any hints of our weaknesses, lest we temper our legacies with hints of deficiency or any invading armies sense our fragilities. (Really, Merneptah? You didn’t have any bad days?) I think this is changing a bit as of recently, but the dominant form of end-of-year reflection seems to be a list of accomplishments, if at all possible. Stories are strange because they can conceal as much as they reveal, and in my own story-telling, I hadn’t communicated any struggle. In reality, it is both the case that 2018 was a tough year in a lot of ways and that I had a wonderful year by all of the appropriate measurables. Furthermore, the thing that made the high points this year feel so rich was their juxtaposition to the nadir of a year that preceded it (2017—my ‘oh heck’ year). While it’s more enjoyable to see myself as part of a triumphant story (like Odysseus! Wait, he had trials, too…), this is not a complete story. So, my question for you is whether the stories you are telling are true and complete. For your own sake, conceiving of yourself only in terms of your excellent moments is not a great way to mature and improve because you are ignoring your worst qualities. And for the sake of others, singing your story in all one key is not an effective way to connect with others, who might be having similar struggles. In general, if you only communicate high points, you are less relatable because hard things are part of life. Everyone has bad days and difficult seasons. What Is the Implied Teleology? That is, the stories we tell communicate lesser purposes (like whether I plan to run a marathon next year or not, and how this present moment factors into that future moment) and major purposes (like who I am and what I am doing here on earth). Think about it. Is there an aimlessness in the way you talk about life or running? Then maybe before you set specific goals for 2019, you should sit down and think through where you would like to be in the future—and, more importantly, who you would like to be. Are your stories hopeful? Well, what is it that you are putting your hope in? And if they are not hopeful, consider why not. What Is My Relationship to Other Stories? If your story is all about yourself, that’s probably a bad thing. MacIntyre means this in two senses—both that we participate in each other’s stories, and that we (ostensibly) have a shared narrative imagination for who we are and where we are going, which makes sense of our own stories. We learn about roles, rules, and personhood through the stories we are told. Furthermore, in telling our own stories, we shouldn’t conceive of ourselves as the leading actors in a play, in which everyone else is the supporting cast. We are not alone here, so telling stories in which only our own personal agendas prominently feature is a bit egotistical. We are part of each other’s stories. The year 2018 was a medium year—with highs and lows, victories and weak moments. This year, I enjoyed the simple grace of being able to put my sneakers on to train nearly every day, and the privilege to push my body hard after a difficult year in 2017. Looking forward, my aim is to continue to press my boundaries as an athlete, as part of a well-ordered life, and to grow in courage and strength. I want to mature as a wife, philosopher, believer, and friend. I also want to find ways to build into other people’s stories and to be a vehicle of grace and support for people I meet who are struggling. This is my story of 2018. I hope 2019 is equally as rich. What is your story about your 2018 in life and running? Now, challenge yourself to reframe that story differently. For example, if it was hopelessly optimistic or pessimistic, try framing it in realism. What is your story now? How do the people who immediately surround you in life and running factor into your story? And how about our running community as a whole; are the collective we a part of your story, too? MacIntyre, Alasdair. After Virtue: A Study in Moral Theory. Second Edition. London: Duckworth, 1981. p. 216. I will think of how I frame my own experiences. In one story, highlighting the positives. In another, also taking the time to consider the bad parts and not just ignoring or pushing it away. Thanks for this thoughtful article! Best wishes with getting settled in Kentucky. I recently relocated to a new place completely different from what I’m used to. I can think of the good and bad of this new place as well. Are you working on a book? :) I would buy it and read it! Thanks so much for posting, Nan. You’re right about not ignoring or pushing away the hard things. The key is not being optimistic or pessimistic at the cost of being truthful. In general, there are places to learn and grow even through good things, and there are bits of grace in the hard things, too. And I will write a book someday. Thank you! Thank you, a thoughtful analysis. I remember a reviewer in the London Review of Books was puzzled by the amount of philosophy found in flyfishing books, calling the authors “hermits in gumboots”. Here we find ultra runners are no different, philosophers in running shoes..
China Mieville, With One Bound We are Free: Pulp, Fantasy and Revolution (link from my name). For this reason I tend to mistrust stories, my own not exempt. I think now of writing or storytelling as a sort of flower arrangement: take the words and arrange them in a nice bouquet. Its meaning is created but the components persist in their own meanings. Ha yes! I love that comment about being philosophers in running shoes. I’m not sure I completely agree about the manufactured nature of stories to the extent you describe–that the meanings are just created by us. Sometimes our hands our forced in telling particular stories (such as when we are trying to tell a victory narrative but keep encountering struggles)…or when we are trying to create a bouquet of roses but only have daisies…And I think an important question is whether the stories we tell adequately map onto the reality of things. But, in terms of the value of different outcomes in running specifically, I do agree. We impose meanings on things that might not be shared by anyone else. And that’s part of what makes running so fun. We define the terms of success to a large extent. Yes, our brains really are wired up to want to hear and tell stories about how the monster was slain, the kingdom was saved, and the people lived happily ever after. What we tend to leave out is that the people never felt as alive and full of purpose as they did while fighting the monster; and how, after the kingdom was secured, they went back to bickering and complaining, and being consumed with worry about who they were and what life was all about and what their place in the universe was. Anyway, my running year was basically like yours, except without the titles, podiums, national teams, or any PRs or course records. But my peer cohort at this point in life consists of ex-runners, neverrans, and the dead, and none of them have any interest in my running stories, let alone any of their own to tell me. (OK, there’s the one guy who needs to keep reminding me how much better he was than me three decades ago when he still ran, but otherwise…) Be thankful that you have people to share your running stories with. That really is the best part.